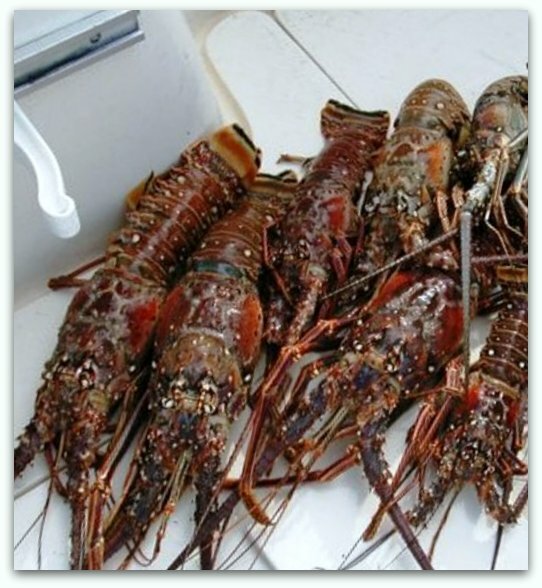 Found on the West Coast as well as the East coast (different species) Rock Lobster or Crayfish are widely eaten. They are very similar to Lobsters and so are easily substituted if you are not from Africa. 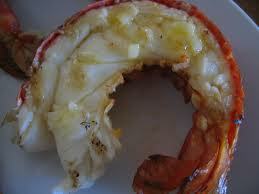 It is best as always to use fresh or live Lobster. If live, merely drop them into a container of fresh water for 10 minutes. Painless, stress free for both Lobster and Cook! No stabbing in the right spot with knives etc! If you are convinced of their freshness, frozen raw crayfish is also fine. For the size commonly sold in Southern Africa (400g or about three quarter of a lb) you will need to drop them into briskly boiling water for 7 minutes. Put a cup of brown sugar into the water...it does all sorts of good things to the flavour! Remove and plunge into cold water and allow to drain on draining board. lightly larger Fish cook for 10 minutes. These are blanched semi cooked fish. From here you need to twist off the tail from the abdomen firmly and draw it apart. Break off the claws and feelers and crack open the abdomen and rinse under flowing water. (all this if you have the patience to pick out the meat which I don't) Use kitchen shears and slip it under the carapace where it is broken from the body. Snip along the belly to the tail. Pull the shell away and reserve it for garnish. There are now a few ways of continuing. 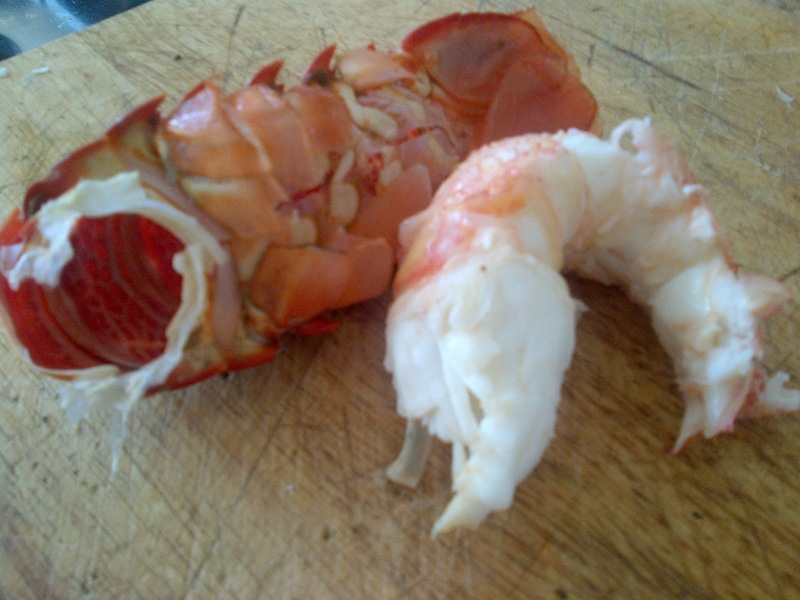 Check out this method by Chef Hansen who is an extremely promising South African Chef here: Curried crayfish is a popular dish in Southern Africa, but it is more commonly eaten very simply with butter lemon and a touch of garlic. Whole lemon zest grated and juice reserved. A heaped tablespoon finely chopped dill. A good chunk of butter or olive oil if you prefer. Half wine glass good brandy. Split the individual tails into two "C" shapes and remove the vein. Heat a large pan or cast iron griddle and heat the butter until starting to color. Throw in the garlic. Then work quickly and Immediately add all the tails if they fit. Cook for about a minute and turn the tail halves over. Throw in the dill and lemon zest and a good twist of fresh black pepper. Squeeze your two lemon halves over the tails and add the half glass of brandy. Light it and keep tilting the pan until the flame goes out. Another minute and remove from the pan. Serve immediately if possible either on rice with the pan juices or with french fries(my personal favorite!) 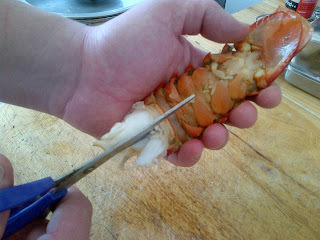 It is also nice to snip the shells into similar shaped halves and serve the tails in the shells. How lucky to be able to find fresh lobster like this! I am jealous! It must taste divine! It is out of this WORLD!! Nothing like it! Wow, this looks so tasty! I adore lobster! I love it as well. Such a delicate yet rich flavor. So easy to spoil with too much herbs and spices..
Hello there, You've done an incredible job. I will definitely digg it and personally recommend to my friends. I am confident they will be benefited from this web site. Mussels. Quick and very delicious!